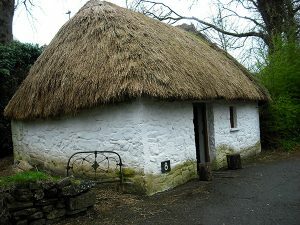 It is believed that cottages evolved as advancing building techniques employed for the larger estate houses trickled down through the laborers dwellings. The materials used varied from region to region as they would generally be sourced within a 5 mile radius. The only method of transport would be a donkey or ox and cart. Stone would predominantly be used in coastal and rocky areas, muddy clay in the midlands and even turf in boggy areas. 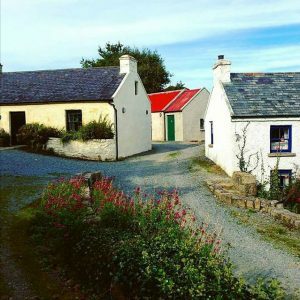 Cottages literally grew out of the landscape that surrounded them.Where a few cottages were located together the community became known as a Clachán – a type of farming collective. The surrounding land within a clachán was divided up amongst the inhabitants in scattered plots of good, medium and bad grazing land – this was known as the Rundel System. A similar system of ‘commonage’ still exists today where no one farmer owns the land but several maintain grazing rights. Early cottages did not have any foundations however as they advanced trenches were dug and filled with stones, clay and mud to stabilise them. Floors were often constructed of compacted mud or clay although flag stones were frequently used where available. The fireplace or hearth usually formed of stone and located at the center of the house with a bedroom behind it to further absorb the heat. Some fireplaces were built of wattle and daub, however remnants of these are few and far between as the introduction of the hotter burning fuel – coal necessitated stone flues to prevent chimney fires. 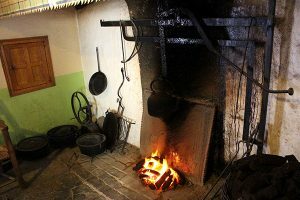 Although a central hearth was prevalent there are many examples of cottages where the hearth is located on a gable wall and yet more where they were at either end of the cottage – sometimes to heat a bedroom and other times purely for aesthetic reasons. Roof construction varies through the island with full gabled walls in the north-west and western region, in the midlands barge gables are common. Also in the midlands and towards the east and southern regions hipped and half hipped roofs are quite popular. 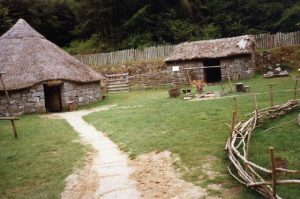 Regardless of their design, traditional roofs were usually constructed of coupled rafters, then they were stuffed with turf for insulation and the exterior was usually thatched. The materials used for thatching varied according to the regions produce, in areas with good arable land it was oaten or wheaten straw, other materials included heather, rushes, marram grass and flax where there was linen industry. 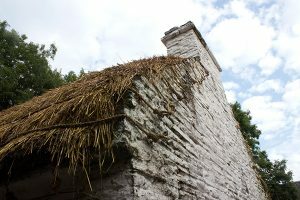 Another roofing feature of coastal areas is that of ropes securing the thatch to the cottage like a large hairnet to brace it against the abrasive weather conditions. Thatcher’s were highly respected tradesmen and securing ones services was an art form in itself. You had to put your self in the way of the Thatcher so he knew your roof needed to be done but also not be insistent lest he get annoyed with you and not come at all! 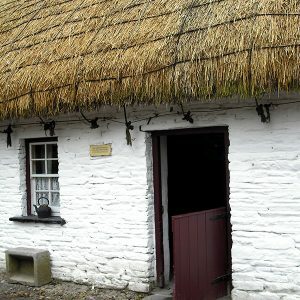 Often minor repairs to a thatch would be undertaken by the owner of the cottage themselves. In rocky areas such as the Burren in Co. Clare, stone or slate was often used as a roofing material and their longevity meant they became more widely used with time as transportation methods improved. Corrugated iron was another less attractive method of roofing employed and can still be found although mostly it is now used as a cheap and quick alternative for roofing sheds and outhouses. Although cottages came in many sizes, they were all only one room deep. The length of the timbers available for the roof determined the width of the house. For many inhabitants of coastal areas and islands, the primary source of rafters was timber washed ashore from the wrecks of ships. At the smallest end of the cottage spectrum were the laborer’s cottage or Bothán Scóir, traveling laborers would build these one roomed houses as they moved from farm to farm, working the land for about 80 days of year to pay rent and the rest of the year as their wages. These houses are simple affairs with mud floors, sparse furniture and often not even a window. The byre dwelling was a slightly larger cottage that was shared with the animals. Livestock were an extremely valuable asset to poorer farmers so they kept them within their dwelling. Usually built on a slope or at least with sloped floors with the animals on the lower end so their effluent would run away from the living quarters. This arrangement meant the animals were close at hand if there were any problems or the weather was too poor to tend them and they also benefited from the heat of the fireplace. Another form of this dwelling had the family living in the loft area over the livestock with an external staircase accessing the living quarters. Many of these dwellings were converted fully into livestock barns as the family’s fortunes increased. On the larger end of the scale were the thatched mansions – two story thatched farmhouses that were often extended from single story cottages as the occupants become wealthier. 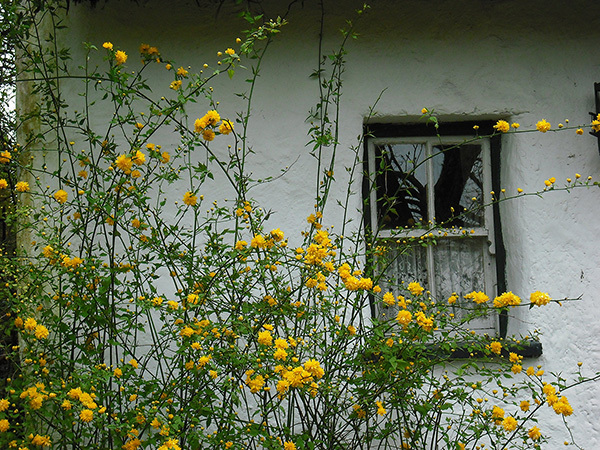 The Old Farm cottage in Co. Kilkenny is an example of such a dwelling. Thatched mansions still remained one room deep but were much taller; it was considered bad luck to build in any direction other than lengthwise. The most popular form of cottage is that with the living area at the center with the hearth fireplace and a bedroom on either end. The ceiling of the living area usually extended to the open rafters although the space over the two bedrooms was often utilised as loft sleeping areas. The loft facing the hearth was sometimes left open to below with a ladder to access it. Another more unusual sleeping arrangement often found in northern cottages was the nook or outshot, an alcove built into the cottage walls close to the hearth where the elderly inhabitants of the dwelling slept for the warmth. The outshot would usually be curtained off from view of any visitors. The general rule was that the front door of the cottage faced south where elemental considerations allowed. Some cottages had a door on either side which were used to combat the prevailing winds. A most notable characteristic of the cottage is the half door, an ingenious device which kept the children in and the animals out. A secondary use for the door was to allow in light and air, most cottages were damp and stuffy as a result of small windows and smoke from the fireplace. A third use was as a prop to lean on while smoking the pipe, gossiping with neighbors or shouting that the food was ready. The size and number of windows in a house were curtailed by practicality and to a lesser extent – window taxes. Window taxes were levied on houses with more than six windows from 1799 until 1851 and because of respiratory problems caused as a result of reducing windows they became known as the ‘typhus tax’. However the main reason for small windows was to retain heat in the winter and to keep cool in the summer, in that respect cottages operated similar to caves. There were often small windows on the first floor of the gable walls where there were loft accommodations however they were never on the ground floor. The walls of a cottage were typically about 600mm thick to support the roof and beams (as opposed to the 300mm standard today), this led to the attractive deep window reveals found in most cottages. As cottages progressed several new features began to be added. The screen wall was built inside the front door to provide a relief from draughts and added privacy, however sometimes this privacy went against the occupiers as they couldn’t easily see who was approaching, to combat this a window was often included in the screen wall. The parlour room was ‘the good room’ behind the hearth with another fireplace opened up into it – a rather grand feature copied from the estate houses as family became wealthier. 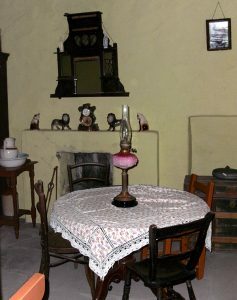 The parlour was rarely used for the family, instead it was maintained meticulously in case of visiting dignitary’s such as the priest, doctor or teacher. Water was supplied to cottages by means of a well that would be located by a diviner. A diviner uses a hazel forked twig to determine where spring water is to be found, it’s a skill that is said to be in the hands as only some people can feel the energies of the earth keenly enough to follow them. Once located it was the duty of the daughters of the dwelling to bring buckets of water from the well each day for drinking and cooking. Water for washing cloths, floors and general domestic and farm duties came mostly from the rainwater collected in barrels at the ends of the thatch. Light was provided from the hearth and also from burning rushes dipped in fish oils, the smell was horrendous and the light fleeting. Candles were more expensive and sometimes difficult to come by, they were preserved for good occasions and were often used as a method of barter. Electricity did not reach rural Ireland until the governments Rural Electrification push between 1946 and 1979. Range fireplaces began to replace the open hearth fireplace in the 1800’s, these gave more efficient heat and cooking conditions. As far as we believe we have come, old Stanley solid fuel ranges are still very popular in Ireland providing that same old, moist heat that our ancestors sat by decades ago.